When you see a movie at the theater, what is the main factor that draws you in? Of course, it has to be a movie that you will enjoy, but don’t you go to experience a movie on a large screen that has surround sound audio to match? Having this experience at home can be just as rewarding. You already have a big screen television set, so you just need the sound to complete the experience. If you have the space and the cash, get the best of the best. This guide is designed to help you determine what speakers you need and what other features need to be considered. We have compiled a list of some of the best 7.1 home theater sound systems on the market, so just take it all in before you make a decision. As a gold pick, you should expect the Klipsch RP-280F sound system to be a great one. 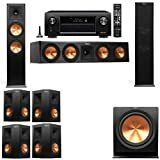 It comes complete with two Klipsch RP-280F towers speakers, a Klipsch RP-450C center speaker, a Klipsch R-115SW subwoofer, four Klipsch RP-250S-BLK surround speakers, and a Denon AVR X4100W audio/video receiver. It is an amazing looking home theater system that you will be proud to show off; in fact, it is encased in a brushed black polymer veneer finish that will go with any home theater system. Starting with the two tower speakers, you will notice that they are pretty large; in fact, they are the largest in the Reference Premier family. The towers stand 43.06 inches high, 10.55 inches wide, and 18.32 inches deep. It has a weight of 62.5 pounds, so once you find the perfect location for these monsters, you may not wish to move them again. Each one features two cerametallic cone shaped woofers that are eight inches across and a hybrid tractrix horn that is located at the top of the tower. The size of the RP-270F tower speakers is large enough to produce the sound effects and music for a large room, so the next time you have a big gathering make sure to have plenty of seating options. The center speaker is a gorgeous unit that will look lovely positioned beneath your television. It is 6.81 inches in height, 31.13 inches in width, and 14.51 inches in depth, and it weighs in at about 35.7 pounds. The RP- 450C is a sizable speaker that has four matching cerametallic cone shaped woofers; two on each side of the titanium tweeter with a hybrid tractrix horn. The four surround speakers feature the same high frequency and low frequency drive on each side, but they are much smaller in size. The subwoofer is a front firing device that features a 15 inch copper spun cerametallic. This subwoofer is great for producing low frequency bass that is so powerful it will wake the neighbors. The AV receiver is designed with built-in Bluetooth, which means that you can connect to any device that is Bluetooth compatible. This device can save up to eight different Bluetooth settings, so you will not have to manually input the information each time you use this feature. It also has built-in Wi-Fi that can connect to your home network and allow streaming content to play from sources like Spotify, Pandora, and other such streaming sites. Each of the seven channels associated with this amplifier is rated at 125 watts, so you will be able to get a crisp sound from every corner of the room. In addition, there is an eco-friendly mode that can be entered when the system is not in use that will decrease the wattage being used by half. Loud bass can sound great to us, but it may be extremely annoying to close neighbors. To prevent this from occurring, the Denon AVR X4100W is Audyssey LFC ready, which means that it uses psychoacoustic algorithms to prevent bass from passing your walls without requiring you to lower the bass in the room that you are being entertained in. This receiver is capable of maintaining a great theatrical presence in the main room as well as two other areas. Each viewing zone can engage in watching the same movie or three separate ones can be enjoyed. In addition, this system also comes with the capability of using Dolby Atlas, which is sure to give you an audio experience that you will not forget. There are eight HDMI input jacks available on this home theater system as well as three HDMI output jacks. There are also several other types of connections available, which include a USB port, component and composite input and output jacks, and a microphone jack. In addition, you can digitally play your music through the speakers using your iPad or iPhone. There is also a Denon remote app that is available for Apple and Android devices. You will be able to save four different preset buttons, which means that you can access your favorite internet radio stations with a quick button press. If you are relaxing and enjoying a surround sound experience before bed, you may want to set the sleep timer, which can be set in ten minute increments up to two hours from the time you set it. That is ample time to watch most movies before the system goes into sleep mode to save the power while you are asleep. This Klipsch home theater system is designed to last you a long time. It is a bit on the pricy side, but the manufacturer stands behind the durability of this combination of receiver and speakers with a five year warranty that covers the parts and the labor if anything goes wrong with the system. They also include a three year warranty on the electronic aspects of this home theater combination. Our silver pick is the Infinity Reference home theater system. It features a stylish black exterior that is highlighted by the chrome trim and the soft painted waveguide. It comes complete with a Harman Kardon AV receiver as well as a full 7.1 set of speakers, which include a pair of four way 6 ½ inch woofers, a 5 ¼ inch pair of midrange tower speakers, a pair of two way 6 ½ inch woofer bookshelf speakers, a 6 ½ inch woofer center channel speaker, a 12 inch powered subwoofer, and a pair of two way 5 ¼ inch surround speakers. The Harmon Kardon AV receiver is an eco-friendly solution to bringing power to this home theater system. This receiver uses light weight digital amplifiers instead of heavy transformers to create a smooth, yet powerful sound. Each channel features 100 watts of power that can be witnessed at two separate locations in the home. Audio can be streamed through Bluetooth, and there is also a USB port for additional connectivity options. 4K video pass-through is also available with this receiver. The surround sound bookshelf models are the perfect size for a speaker set that your guests will appreciate. It is 13 ½ inches in height, 6 7/8 inches in width, and 7 3/16 inches in depth; in addition, these bookshelf models only weigh 12.8 pounds, so they will never cause a shelf to buckle under the weight of them. They feature a three way design that uses a one inch dome tweeter and a 5 ¼ inch flat piston midrange woofer that is encased in a chamber that will enhance the sound that comes through the bookshelf speaker. Next, let’s take a look at the tower speakers that come with this home theater system. They are simply stunning, and tall, but that will look great next to a large 4K HDTV. They are 44 13/16 inches high, 7 7/8 inches wide, and 14 ½ inches deep; in addition, these massive speakers weight 50.6 pounds, which means they are not easy to set up alone. The RC263 features a three way design that will enhance all of the sounds and musical effects you hear in any movie. Starting from the top of the tower, you will see a one inch dome tweeter. Directly under that, there is a four inch flat piston midrange that is encased to enhance the overall acoustic sound. The bottom half of the tower speakers are fitted with 6 ½ inch enclosed woofers. The woofers of this speaker tower are enclosed to allow you to place the speakers against the wall without causing extra vibration or sound interference. The center speaker has a dome tweeter as well as a flat piston midrange on either side of the speaker. The surround sound speakers are designed with a one inch dome tweeter on the two forward facing angles. These speakers are designed to be placed in a corner, so that part that would touch the wall is bare. The subwoofer is another powerful aspect of this system; in fact, it actually weighs 40 pounds alone. In addition, it is designed with a 12 inch woofer that is enclosed to make the bass sound even more amazing. This speaker technology setup is referred to as Hemispherical Soundfield Technology. It means that each channel or speaker is designed to cover a 180 degree area of the room, so make sure to fill up your room with theater seating to match this amazing home system. Some of the other features that are present on this home theater speaker system is the CMMD feature, which places aluminum drivers between ceramic layers. This is designed this way to enhance the sound details that you hear. There is also a digital amplification feature that is designed to lower the amount of power being consumed without sacrificing the performance. In addition, cabinets that encase the actual woofers are designed to reduce the excess vibrations inside the speakers for a crisper, more natural sounding audio experience. 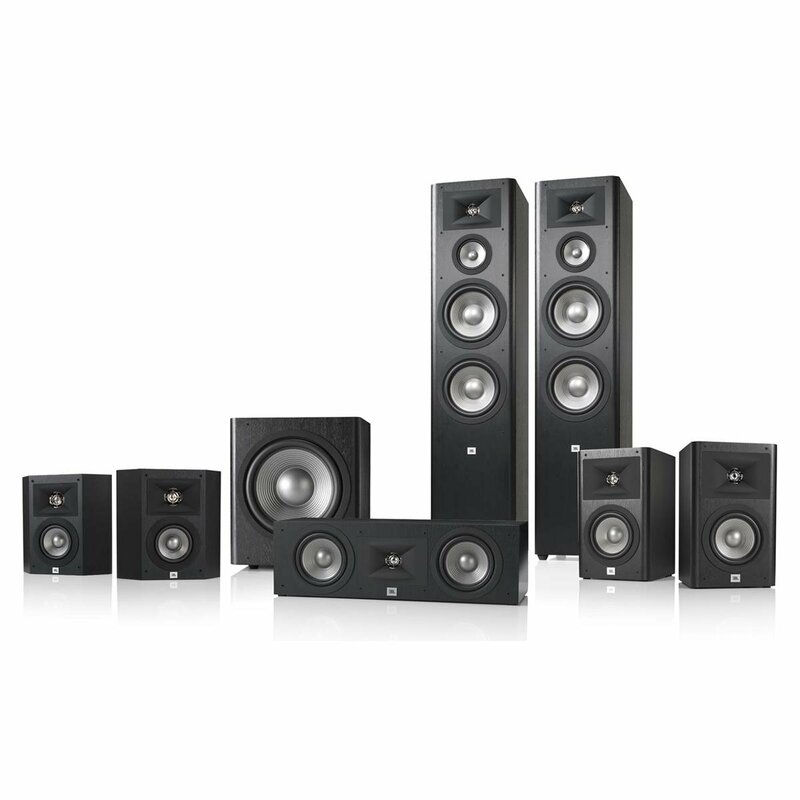 This home theater sound system comes complete with a five year warranty on any parts and labor as well as a two year warranty on the electronic features. Insofar as reviews, you can find a great many if you do individual research on each type of speaker and the receiver, but there are not a lot for the entire set. The reviews that do exist on Audioholics and other such sites are mostly positive reviews, but as previously mentioned if you want to look through reviews, make sure to check out each speaker type individually. Our third place pick is manufactured by JBL Studio, and it is a refined sound system that goes beyond many others that are available today. Aesthetically the 290 is a system that features soft rounded edges on a black glossy exterior. This home theater system comes with a pair of Studio 290 three way floor standing speakers, a pair of studio 230 6 ½ inch two way bookshelf speakers, a pair of Studio 210 two way surround speakers, a Studio 235C 6 ½ inch two way center channel speaker, and a Studio SUB 260 P 12 inch powered subwoofer. Starting with the floor standing speakers, the first thing you will notice is the sleek black exterior that is present on all of the speakers in this setup. They feature dual eight inch Polyplas drivers that are designed to give you twice as much sound potential as the competition. It also includes a one inch CMMD high frequency driver to maintain a low point of distortion. In addition, the edge to edge bracing inside of the cabinet minimizes the amount of vibrations that can be heard. The bookshelf speakers are designed to be placed on a shelf or a cabinet of some kind, so they are only about 17 pounds. It features a horn shaped high frequency dome as well as two four inch low frequency transducers. The center channel speaker is designed to bring audio depth and an immersive experience to every movie you enjoy on this home theater system. There are 6 ½ inch Polyplas drivers on each side of the speaker. They are designed to enhance the bass response and make the audio experience more realistic. Between the dual drivers you will see a horn shaped driver that is designed to give you a wide range of sounds. In addition, high definition imaging makes it possible to create natural high quality balanced audio that can be heard anywhere in the room. The subwoofer features a 12 inch transducer that is designed to transmit low frequency bass audio that will wake the neighbors. The subwoofer has the same type of exterior design as the other speakers in this sound system, which is a design that will go well in any media entertainment room. Unfortunately this home theater system does not come with a specific receiver, but there are plenty of compatible options that you can consider. Make sure to get a receiver that is compatible with your entire home theater set. This speaker set is 7.1, so you will need to assure that you will have access to all of the channels that you need. When it comes to the reviews of this JBL Studio home theater system, there are not a lot available for each individual speaker, but as with our silver pick, there are plenty of opinions on each individual speaker, so make sure to check them out before you decide if this is the home theater system that is right for you. Entertainment is designed for each and every one of us, so no matter what your personality is, you will at some point want to be entertained at home. Many people envision a home theater system as a costly expansion to their media room, but it does not have to be. If you are ballin’ on a budget, then you should consider the Onkyo SKS-HT540. It is a great 7.1 home theater sound system that will not let you down. It comes at a much lower price point than the other picks on this list, but it still offers you a quality sound experience that you are sure to enjoy. This setup features a center two way speaker, two front speakers, four surround speakers, and a subwoofer. Each of the speakers are finished with a black ash mesh that is encased with a silver edging and back. The front two speakers as well as the center speaker feature two five inch woofers and a one inch dome tweeter. The four surround sound speakers are designed to give you an optimal audio experience so they also feature a 3.1 inch woofer as well as a 0.75 inch ceramic dome tweeter. There is one downside to purchasing the cheaper option, which is that the wires are connected with cheaper material than the high end speaker systems. The subwoofer is designed with a ten inch woofer and a ten inch cone driver. You will not be lacking any bass, since this subwoofer comes with 230 watts of pure power. There is also an input RCA jack located on the subwoofer for your convenience. All types of music sound amazing on this system, but you will especially love the brassy undertones found in classical jazz music. This system is even capable of filling a large room with rich, enhanced music, so kick up you heels and dance the night away. All-in-one Setup or Build your Own System? Choosing to purchase an all-in-one setup means that you will have no work to do. No comparison shopping, no matching up speakers to make sure they look good together and no installation hassles. You will also most likely save a few bucks by going this route, but you may also not get the optimal speaker options that you prefer. • A center channel speaker – This speaker reproduces the majority of the dialog that is spoken in any movie. It typically has a design that allows it to be subtly placed on a shelf in front of the television. Many movie lovers will most likely consider this the most important speaker in a 7.1 setup. • Front left and front right speakers – These two speakers are designed to deliver the music and ambient sounds on a sound track. If you are listening to a lot of music, these speakers will make the different frequencies stand out more. • Four surround speakers – The surround sound speakers are designed to recreate the sounds that are heard from the front two speakers. This allows you to feel like you are in the middle of a forest or rafting through some rapids. • A subwoofer – The subwoofer is present to produce low end bass throughout any movie or musical experience. Don’t forget that building your own system means that you need not only these different types of speakers, but you will need a receiver as well as some type of media player. There are lots of considerations to make if you are designing your own system, but the ability to customize your setup is outstanding. You can have all of the features you desire as well as a style that fits you. 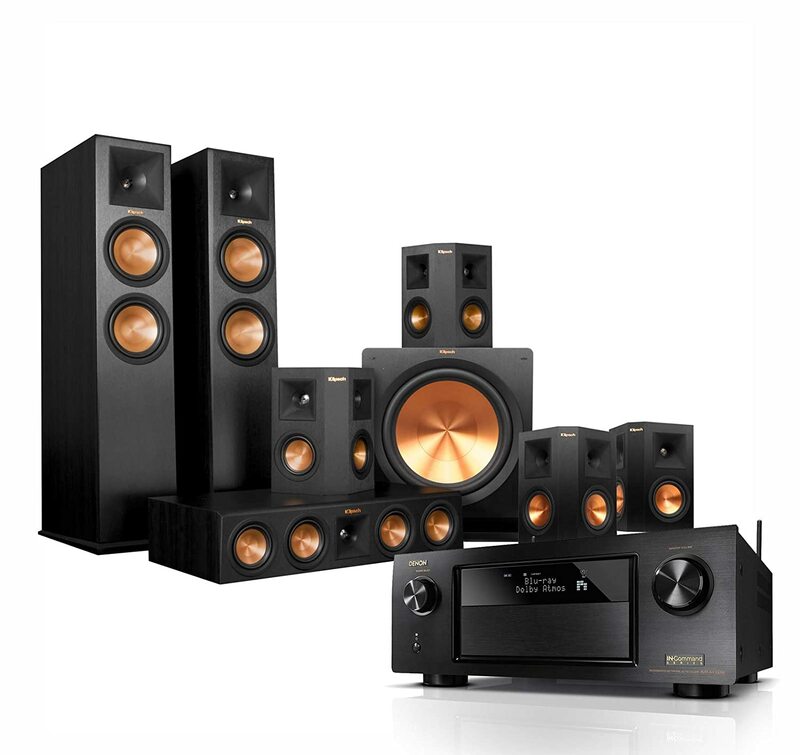 Before you decide to purchase a 7.1 home theater sound system, make sure that you have the space for such a set up. You also need to make sure you can place the speakers in the correct locations to get a fully optimized surround sound experience. The center speaker needs to be placed near your television. It will produce a lot of the sound so it needs to face in the direction that you will be viewing the television from. The subwoofer can be placed next to the wall near the television or next to one of the front speakers if you desire. The front left and right speakers, which are the tall speakers that are designed to be placed on the floor, should be placed on opposite sides of the television. Make sure that these two speakers are at least six feet from each other as well as an equal distance from the screen. The four surround sound speakers should then be placed behind and beside where you will be sitting. Make sure that these speakers are about three feet above where your head level will be so that you can get the best surround sound experience. A receiver should have a wattage that ranges between 80 and 100 watts per channel. Make sure that if you are looking to get a 7.1 speaker system that you have a receiver that is compatible with this set up. Some receivers have special features that you may want to consider as well. For example, some receivers allow you to transmit different sounds to different areas of the home. You will be able to watch a different movie than the rest of your family if you wish to do so. Some receivers also have methods of connecting the sound system to other devices, so make sure that you look for the connection type that you need. Also, if you play a lot of games, watch movies, and listen to music, then you may want to confirm exactly how many HDMI slots you need. Personally speaking, a good home entertainment system should have at least five slots available to keep your movie and game options open at all times. Your speaker and receiver wattage needs to be consistent. Purchasing speakers that have a lower wattage than your receiver could result in irreversible damage to the speakers. The best way to make sure that this does not occur is to purchase your speakers after you decide on a receiver. 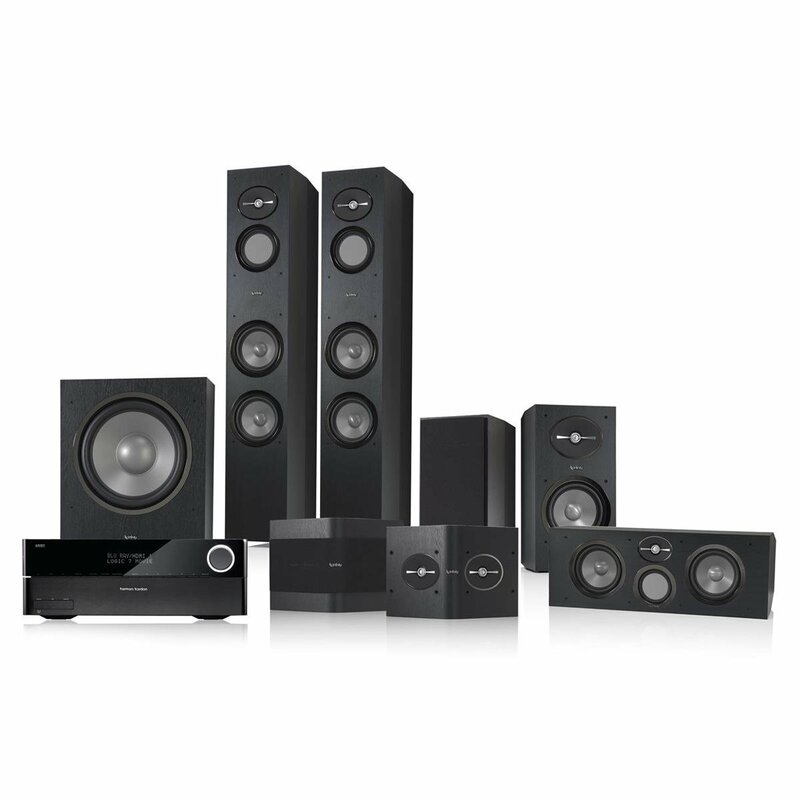 There is a huge variety of speaker types to choose from when it comes to a home theater sound system. Do you want speakers that sit on the floor, speakers that are built into the wall, or another type of hidden speaker setup? Cabinet speakers are generally going to produce the best sound quality. These types of speakers can also be designed to be mounted on the wall if you prefer. You can also choose to have built-in speakers, which can be built into the walls or ceilings. If you decide to mount your speakers, then you can customize the exterior of each speaker to match your walls. The other option is to purchase wireless speaker options that are designed into pieces of furniture. One of the more common items for wireless speakers to be placed in is a lamp or a bookshelf. A preamplifier is a requirement for an audiophile. A preamp is a device that is designed to boost your audio signals and transfer the signals where they need to go. The sound produced using an amplifier is often a higher quality output, which means that you will have a better audio experience when you use one in your home theater system. If you are building your own home theater system, you will definitely want to invest in a preamplifier. Do you have a large 65 inch television that you plan on incorporating into your new home theater? If so, large speakers that have a little attitude can be an excellent selection to give your set up more of a wow factor. If your television is a bit on the smaller side, then perhaps you will want to purchase smaller speakers that you can put on a bookshelf or in other hideaways. Speakers come in different shapes and sizes, so it is important to find a home theater sound system that is consistent with your style. Maybe you prefer black speakers or maybe you would sooner have wood encased speakers. A home theater sound system can utilize speakers that are placed in an open area or they can be placed in a more discrete location. Other style designs that you may like to have in your sound system are metallic subwoofers or a cloth or mesh grill. Another consideration that you might want to make is the design of your tweeter as well as any stylish finishes that you may want. Audiophiles have it easy. With all of the technology and the advances in the audio world that have created home theater speaker systems that give you an optimal listening experience, you are sure to be enjoying a full surround sound audio experience in no time. If you love experiencing a fully immersive audio experience, but you have never had a home sound system, then check out our pre-purchase considerations. Take note of what you want and need to achieve in a system that can be compared to a theater. If our top picks fall short of your expectations, then take what you’ve learned and have fun finding or creating the perfect home theater system for you.